* 3 ranges, 2500 MHz, 100 MHz, 10 MHz. 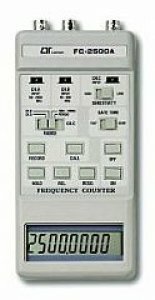 * Frequency, Period, Hold, Relative, Max., Min., Average, 8 digits LCD. * High sensitivity for VHF & UHF frequency. * Size : 173 x 80 x 35 mm, Portable type.